A POSTHUME of RICHARD BROME, An Ingenious Servant, and Imitator of his Master, that famously Renowned Poet Ben. Johnson. LONDON, Printed for Andrew Crook, and are to be sold at the Green Dragon in St. Pauls Churchyard: And Henry Broom at the Gun in Ivy-lane. 1658. 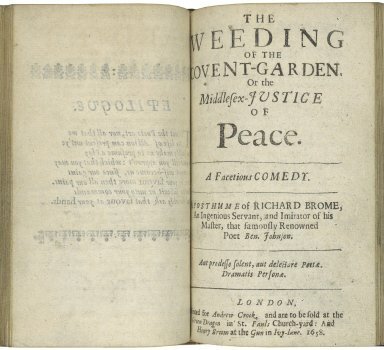 Title page imaged from Folger call number: STC B4872 copy 2. Image is not from the transcribed copy.